According to MedCity News reported , the technology giant Amazon is its “controversial” Rekognition image recognition and image analysis software, services, applications to medical imaging field. Amazon said that Rekognition will work with Amazon Amazon’s Amazon Comprehend Medical medical language processing service to extract personal health information (PHI) from medical images in a more efficient manner through the Amazon Web cloud computing platform. Launched in 2016, Rekognition is one of Amazon’s most controversial products. It is understood that this is an image recognition AI software executed on the Amazon server, which can recognize text, objects, scenes, activities and people on images or images. In the United States, the police have begun using the software to find lost children and trafficked people. However, this move sparked strong opposition from the American public and the question of civil rights advocates, and was protested by more than 150,000 people including Amazon users, civil society organizations, shareholders and even Amazon employees. Among them, the strongest questioning voice comes from the American Civil Liberties Union (ACLU). According to the organization, ubiquitous facial recognition software may invade people’s privacy and create a seamless government surveillance system. In 2018, the American Civil Liberties Union (ACLU) conducted an experiment using Amazon’s face recognition software. The software incorrectly identified 28 members of parliament as former arrested criminals. Amazon responded to the results, saying that the use of ACLU is wrong, it will cause the above-mentioned seemingly absurd misjudgment. Based on cloud computing, big data, artificial intelligence and other technologies, the new generation of medical imaging systems has achieved digitalization, mobility and intelligence. The digital medical imaging system greatly enhances the ability of medical personnel to store, share, view, search and plan images during medical treatment. In addition, with the advancement of digitalization, the types of devices are also enriched. From computerized tomography to nuclear magnetic resonance to ultrasound, data for medical research is accumulating more and more. However, medical staff still face a problem in processing medical image information, and the patient’s privacy data needs to be protected. Therefore, secure data marking and processing are required, but this process often requires manual operations. Personal Health Information (PHI), including the past, present or future physical or mental health status, related medical procedures, medical expenses. The universal identifiers involved in the information, such as name, address, birthday, social security number, etc., are protected by the HIPAA (Health Insurance Portability and Accountability Act) privacy rules. In a medical image file, a medical record, an inspection report, or a hospital bill may all be PHI, and each document contains the patient’s name and other information that identifies the individual. The process of manually removing personal health information (PHI) by medical staff is time consuming and labor intensive. In 2018, Amazon launched Amazon Comprehend Medical, a product that uses artificial intelligence natural language processing (NLP) technology to help medical staff detect and identify PHI in medical texts. A few days ago, Amazon official website said that its Amazon Comprehend Medical medical language processing service and Rekognition image recognition software and image analysis services will be jointly applied to the PHI identification and processing of medical images. 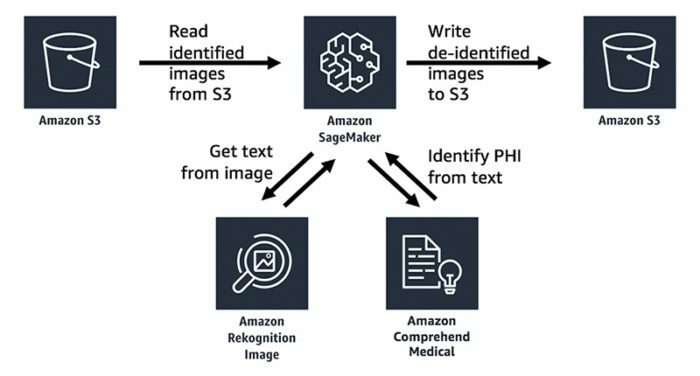 It is understood that in the actual machine learning and prediction results, Amazon Rekognition can extract text from the image, and then rely on Amazon Comprehend Medical function to help researchers identify and detect PHI. In addition, Amazon said that when using Amazon Comprehend Medical to detect and identify protected health information, the service provides a confidence score for each identified entity, indicating a level of confidence in the accuracy of the detected entity. The soft gymnastic author can use the system confidence score to check the identification of PHI in the entity and manually identify if necessary to ensure accuracy.